Nerve fibres. 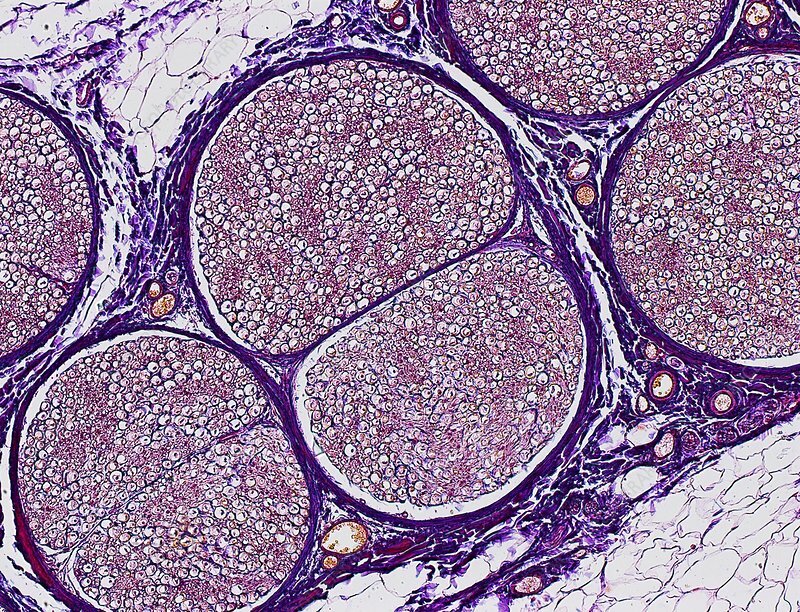 Light micrograph of a transverse section through the sciatic nerve showing a bundle of nerve fibres (fascicle, round). Within the fascicle are many myelinated nerve fibres. Myelin (white) is an insulating fatty layer that surrounds nerve fibres (axons, small dots, purple), increasing the speed at which nerve impulses travel. Surrounding the fascicle is a layer of connective tissue called the perineurium (purple border). All the fascicles within a nerve are bound together by epineurium connective tissue (large purple blobs). The sciatic nerve runs from pelvis to mid-thigh. It is the largest nerve in the body. Horizontal object size: 0.6mm.